A bitter almost dry hopped red, mall in the back but the bitterness takes over. Taste rating in words: Running with a head of steam straight and fast. i literally joined this site to tell people to avoid this beer...i have bought it before and completely forgot about it, and ended up being tricked into buying it again...just to taste it and remember exactly why i don't remember this beer. they trick you into believing its a strong ale, but the truth is its a pale ale whether they admit it or not. the flavor is pale ale. its a strong beer at 7.5%. the first flavor i got was a soap taste that tasted like a cleaning product. in short, pretty much every beer i've had from portland is awful. its supposed to be near a dark beer and a little lighter, so you expect that blend of flavors. instead you have a beer that tastes like a soapy pale ale that gets you really drunk, and headached 15 minutes into the first one. it gets better further on, like most beers change. the flavor changes with this too. but that pale ale is still there in the background and there is nothing i hate more than buying a beer that i am optimistic about, only to be screwed over. Poured from a bottle into a glass, watching old music videos on YouTube. Perhaps the most disgusting, vile smell to be had from any beer. It smells like dry cat food, and it didn't taste any better. 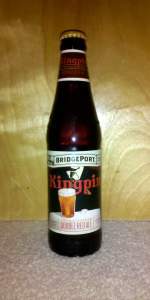 This was the third type of beer that I had from a Bridgeport sampler twelver, and the second with an off-putting smell. I find it hard to believe that any brewery that sells this could remain a going concern, so maybe I just got a stale batch. Clear ruby with almost three fingers of bone color head that lasts around ten minutes leaving a curtain of fine bubble lace. Smell is caramel malt and slightly resinous. Taste is sweet malts with a good balancing hop bitterness. Some floral resinous hop flavors. Mouthfeel is medium with good streaming bubbles of carbonation. The finish initially mostly sweet but the bitter and dry starts creeping in as the sweetness fades. Overall a tasty beer in a style I usually avoid due to the sugar content. Poured various times in a mug, a pint glass and currently having in tulip; it pours an amber/slightly reddish colored body with a slim half finger of a white foamy head that dies and leaves barely any lacing, body is dark red; aroma is dry roasted malts and not really hoppy whatsoever; taste is pretty malty as well; somewhat easy on the palate but not that much to be honest; overall, well, its an imperial red ale so with a high ABV that’s trying to display an "American Red/Amber Ale" sort of quality about it. 12oz bottle served in pint glass. This is one seriously handsome brew: deep red garnet in color, with great clarity, and an ample khaki head. Medium to large barley malt aroma. Flavor is robust and assertive, though fairly one dimensional for my tastes. It's malty, it's bitter, and it will make its presence known across your palate even after you finish the bottle. This is well executed, but Double Red ale just isn't a style that excites me. (From notes) Had it at a social occasion during a Portland visit. It has a nice smooth thick head with a malty smell. The taste was spicy with cinnamon and vanilla, also dark fruit and lemon. Nice creamy feel. A crimson kind of color, deep, ruby, red. About 1/4" of off white head forms. Mildly hoppy, c hops and red malts here. All the usual irish moss, red malt, hops, earthy vibe going on. A little bit of grapefruit creeps into it. I wouldn't agree on the triple hopping bill living up to it, but it did hide the alcohol well and remain pretty drinkable throughout. Plenty of bitterness. I'd say above average for style.